Airmax Aeration System can be installed several hundred feet away from the pond’s shoreline, The Remote Manifold Kit can be used to simplify airflow controls to diffusers. Normally, diffuser airflow adjustments can be made on the compressor manifold, however, when the system is located far away from the diffusers it can be difficult to observe these adjustments on the surface of the pond. The Airmax Remote Manifold Kit allows you to remotely adjust the airflow from the pond’s shore instead of at the compressor. 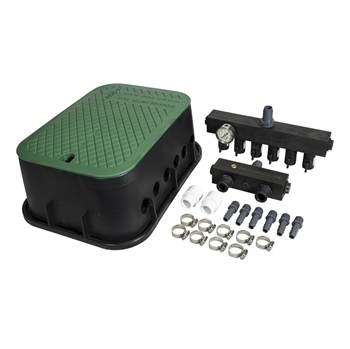 This easy-to-install remote manifold kit includes valve box, manifold and additional adapter to connect compressor(s) to airline.